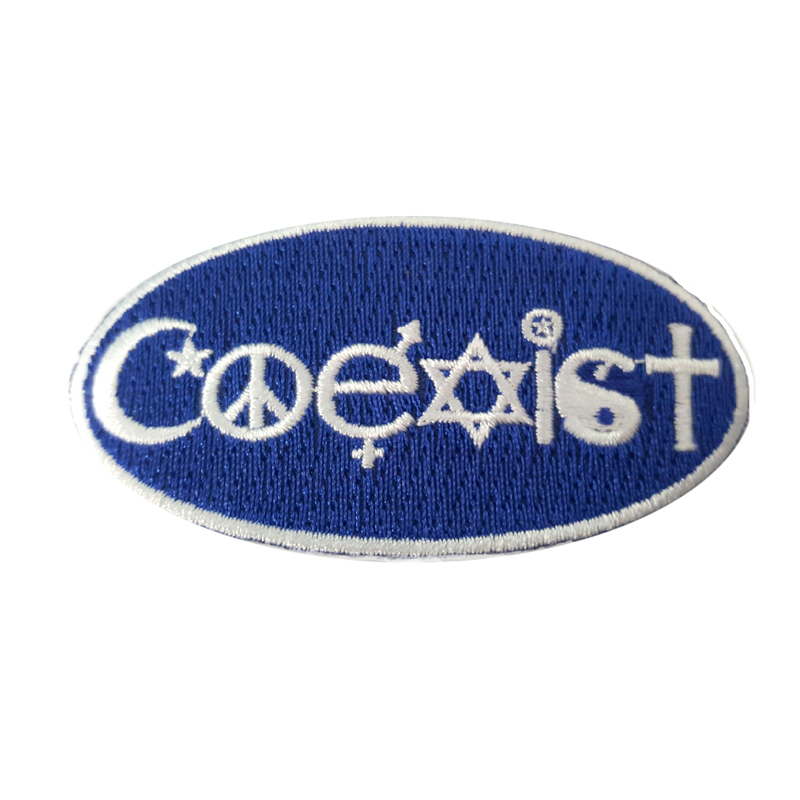 This Peacemonger original Embroidered Patch features our most popular "Coexist" symbol-glyph design. This is our one word poem for Peace. The embroidered symbols include a crescent moon and star for ancient Greek Goddess Diana, also interpreted popularly as a symbol for Islam. The Peace symbol is followed by our original symbol for Equality. Male/female or Mars/Venus symbolic 'e' can stand for social equality for gays and the LGBT community. 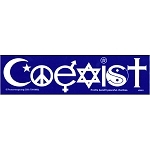 Symbols for Judaism, Paganism, Taoism, and Christianity comprise the other letters in this popular Coexist Embroidered Patch. The symbols are embroidered in detailed white, with a solid blue background. You can iron this Embroidered Patch onto your favorite jeans, tote bag, or back pack, but we recommend sewing it on for long lasting enjoyment. We offer Peace Embroidered Patches, Hemp awareness, Rasta Embroidered Patches and Hemp fabric Embroidered Patches, Social justice and LGBT Embroidered Patches, Nature inspired butterfly and fairy Embroidered Patches, Music and band Embroidered Patches, and more! Discontinued and Sale Embroidered Patches too. Our Embroidered Patches are all high quality, and will last for years. Peacemonger Embroidered Patches make great peace gifts for peaceful people. As with all Peacemonger products, our Embroidered Patches come with an unconditional, 100% satisfaction guarantee. Sew your true colors with Peacemonger Embroidered Patches. This embroidered Embroidered Patch measures 1 x 3.5 inches. Many of the designs on our Embroidered Patches are available as Stickers, Mini Stickers, Buttons, Fridge Magnets and more!